POSTED January 24, 2019 10:53 a.m.
WISCONSIN DELLS — Someone was leaving the JAG with their first loss of the season, and the Black Hawk Warriors girls basketball were determined it was not going to them. Black Hawk, ranked #1 in Division 5 in the latest Wissports.net State Coaches Poll, used a pair of 7–0 scoring runs in the first half to open up a four-point halftime lead on Melrose-Mindoro, ranked #2 in D4, and then the Lady Warriors (15–0 overall) came up strong on the defensive end and at the free throw line in the second half to run away from the previously unbeaten Mustangs (13–1) for an eye-opening 60–42 non-conference victory at the JustAGame Fieldhouse in Wisconsin Dells on Saturday, Jan. 19. “We knew it would be a challenge, and the halftime score shows how evenly the two teams were matched. For us to get it done on a day when our shooting stats were far from impressive is certainly encouraging. 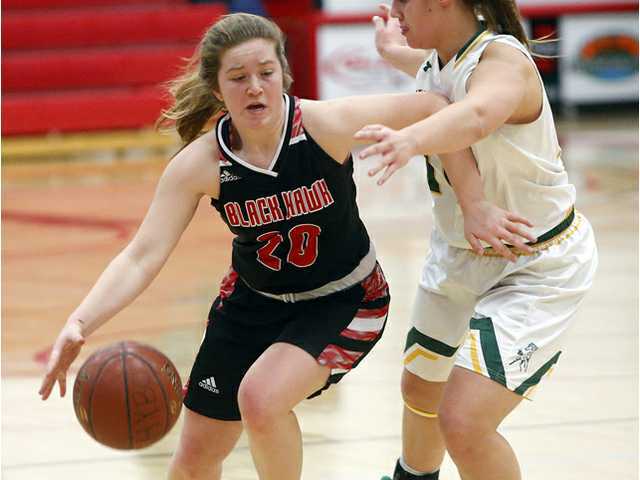 This is that kind of game one hopes will serve as a fitting reference down the road as to the fact that there are lots of ways to win a ball game,” said Black Hawk head coach Michael Flanagan. The Warriors shot just 13-of-62 (21 percent) from the field for the game and were held without a 2-point field goal the entire second half. However, Flanagan’s crew knocked down seven 3-pointers in the game to the Mustangs’ one triple, and finished the game plus-14 from the foul line after sinking 27 of their 38 free throw attempts (71 percent) compared to MM’s 13-of-23 effort. Black Hawk scored the game’s first four points to jump out in front like they typically do, but the Mustangs charged back with an 11–3 scoring run to put the Warriors into an atypical four-point hole. The teams were tied at 13 all and 15 all before a 3-pointer by sophomore guard Bailey Butler shot the Warriors back into the lead for good. A basket by senior Sydney Delzer and a pair of free throws by junior Maddy Huschitt extended Black Hawk’s lead to 22–15. After the Mustangs pulled back within two with three minutes remaining in the first half, the Warriors used another quick 7–0 scoring spurt started by a B. Butler trey to go ahead 29–20. Melrose–Mindoro closed the half with five straight points to cut the gap to 29–25 at the intermission. Bailey Butler began the second half by burying her third triple of the game and sinking four straight free throws to put the Warriors up 36–27. Back-to-back 3s by juniors Kristen Knapp and Natalie Leuzinger extended the lead to 13 points midway through the half, and the Warriors scored the rest of their points from the foul stripe over the final seven and a half minutes of the game as they connected on 18 of their final 24 attempts to pull away for an 18-point victory. “Off the dribble, we got north and south aggressively enough to draw fouls. At the end of the game, we made them come out and get us, which led to them being out of position. On the whole, this team shoots free throws at about 67 percent, which is good. In this game, we exceeded that average,” Flanagan pointed out. Black Hawk went 22-of-30 from the foul line in the second half, while holding the high-scoring Mustangs to just 17 points over the final 18 minutes of play. “At halftime, we adjusted the way that we defended the post, and we felt like that made a difference. With their height advantage, we knew coming in that we would have to be solid on the defensive end, and the girls got the job done by being physical and smart. hey controlled the glass and maintained position. This group also communicates so well, both on the floor and from the bench. It makes us proud as a coaching staff to hear the way that they verbalize our system tenants to one another,” noted Flanagan. Bailey Butler scored 12 of her game-high 20 points in the second half to lead the Warriors to the victory, and she added seven rebounds, three assists and two steals. Leuzinger followed with 19 points and 10 rebounds along with five steals and three assists, and junior Hannah Butler chipped in with seven points, all in the first half, and 10 rebounds in the victory. Junior guard Calette Lockington scored 13 points to lead the Mustangs, while junior center Mesa Byom registered 10 points, 17 rebounds and five blocked shots in the loss. Melrose–Mindoro (13–1) – Frey 5, Lockington 13, Byom 10, Christopherson 5, Simmons 9. Totals – 14 13-23 42. Black Hawk (15–0) – Bailey Butler 20, Hannah Butler 7, Kristen Knapp 4, Natalie Leuzinger 19, Kaylee Marty 3, Maddy Huschitt 5, Sydney Delzer 2. Totals – 13 27-38 60. 3-point goals – MM 1 (Lockington 1), BH 7 (B. Butler 3, Knapp 1, Leuzinger 3). Total fouls – MM na, BH 21. Fouled out – MM: Christopherson, Herzberg.